DEWE-30 series signal conditioning chasses are available for all DEWETRON signal conditioning modules. 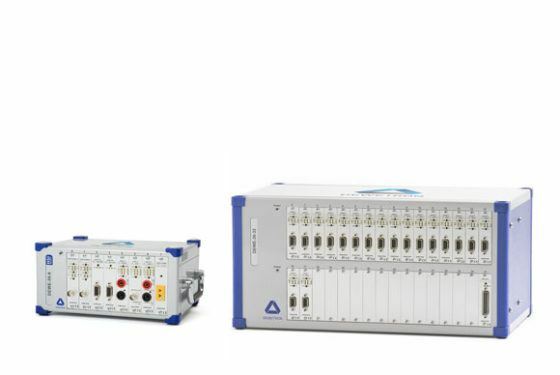 DEWE-30 series signal conditioning chassis are available for all DEWETRON signal conditioning modules and offer a conditioned signal output of optional ±5 V or ±10 V on BNC sockets or a multi-pin connector when DAQP dynamic isolation amplifiers are installed. The multi-pin connector can be configured to match any A/D boards connector so that a 1:1 connection of the analog signals by a high quality cable is possible. For quasi-static PAD series isolation amplifiers the data output is via RS-485. Mixed DAQP/PAD configurations are of course possible.